The only constant things in the NFL are the Patriots, Bengals and Panthers. Every other team has been maddeningly inconsistent. It's made for some pretty pathetic football at times, but it's also led to a lot of wild finishes. In case you missed anything, here are the highlights from Week 9. There were quite a few exciting finishes, though for my money, the Cowboys and Eagles Sunday night game was full of entertainment. We had a combined 46 points in the second half and overtime, including a pick-six from rookie linebacker Jordan Hicks, an absurd touchdown catch by Dez Bryant where he seemed to outjump the entire Eagles secondary, a pair of field goals in the final two minutes – including one from Dan Bailey that bounced off the left upright before falling through with two seconds left. 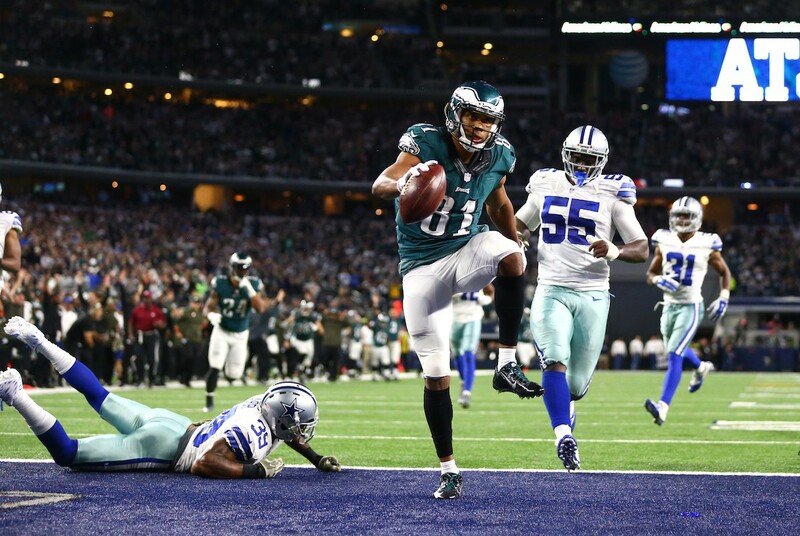 Then, of course, the Eagles converted on fourth-and-1 in overtime, and the very next play, Sam Bradford hit Jordan Matthews for a 41-yard catch and run, resulting in the game-winning touchdown. Philadelphia is very much alive in the NFC East hunt, and even at 2-6, Dallas isn't completely out of things yet. Holy yards after catch, Batman! Antonio Brown set all kinds of records for the Steelers, nabbing 17 passes for 284 receiving yards. He didn't score, but whether it was Ben Roethlisberger or Landry Jones throwing to him, he simply caught everything, and then covered a ton of ground after doing so. Let's give DeAngelo Williams credit, too, as he ran for 170 yards and two touchdowns in place of the injured Le'Veon Bell. The last time Andy Dalton played the Browns on national television, he went 10-for-33 for 86 yards and three interceptions. It's one of the worst complete games at quarterback you'll ever see. Thursday night was a whole different story. Dalton only threw six incompletions, finishing with 234 yards on 21-for-27 passing with three scores, and even threw an awesome block on a reverse to wideout Mohamed Sanu. Dalton had always been the question mark for solid Cincinnati teams in the past, and halfway through the season, he's turned himself into a resounding exclamation point. And there's your punctuation lesson for the day. Sometimes, when a coach gets fired, the team rallies around the replacement, and delivers a performance unlike anything they had shown previously. That happened twice on Sunday, as the Titans and Colts both looked like… well, competent NFL teams for really the first time all year. After dropping their past six games en route to a 1-6 start, the Titans fired head coach Ken Whisenhunt. Interim coach Mike Mularkey paired with play caller Jason Michael to put rookie Marcus Mariota in positions where he could succeed, capped off by an 80-yard drive in overtime. Mariota went six-for-six on that final drive, including a beautiful toss back to Anthony Fasano for the game winner. And new Indy o-coordinator Rob Chudzinski showed us what the Andrew Luck of old looks like. Namely, he showed us via a mix of run and pass, with the more balanced attack giving Luck some room to breathe on passing plays. Both of these strategies worked, as the Colts allowed only one sack; the Titans gave up zero. Is the AFC South suddenly showing some signs of life?! Jason Pierre-Paul was the subject of a ton of ridicule this offseason after blowing off a few of his fingers in a Fourth of July fireworks accident. However, his return to the field was huge for the Giants. With an incredibly tough schedule coming up, the team needed to beat Tampa Bay, and Pierre-Paul was a big reason why. He only had two tackles, but simply being on the field was enough to allow other Giants to make plays. One Giant was Jasper Brinkley, who forced one fumble and recovered another. New York is the only team above .500 in the NFC East, and the defense looked good this week. Coming off a 52-49 loss just seven days earlier, this is an encouraging step forward. Down 13-0 in the second quarter, the Bears could have easily packed it in and faded quietly into Monday night. But give 'em credit–they fought admirably in a 22-19 victory, their third comeback win of the season. Jay Cutler shook off a pair of early turnovers, including a pick-six, and led a pair of brilliant touchdown drives in the fourth quarter. The final one featured a perfect strike to Zach Miller on a seam route up the middle. On the night, Cutler finished 27 of 40 for 345 yards and two scores. He was aided on offense by rookie Jeremy Langford, who did his best impression of the injured Matt Forte, amassing 142 total yards and a touchdown. The Bears still have a way to go, but after a few tough close losses, it was nice to see them pull out a victory. After firing head coach Joe Philbin, the Dolphins appeared to be turning things around before a loss to the Patriots last week. They confirmed this week: they're just actually not a good football team. Chief among their issues is an inability to defend the run–they gave up 266 rushing yards to the Bills. But the Dolphins have also made a habit of picking up stupid penalties, with an ill-timed hold after converting on third-and-long, and an unnecessary roughness penalty negated a sack that would have forced a third-and-18. These kinds of silly penalties don't help, and neither do five penalties on kickoffs and punts. Surely that's some kind of record. The Atlanta Falcons lost to the Blaine Gabbert-led 49ers. The last time Gabbert won a game was on September 23 in 2012. That's more than THREE YEARS AGO! His last full season as a starter, he lasted three games and threw seven interceptions before getting hurt. Something is terribly wrong with Atlanta–the once high-powered offense hasn't broken 21 points in a month, and the defense is looking lethargic. Perhaps most disheartening: Falcons coach Dan Quinn, with his team down four and having fewer than three minutes remaining in the game, opted to kick a field goal from fourth-and-goal on the Niners one-yard line. The odds are always better to go for it in that situation. Quinn didn't, and it cost his team the victory. If you've seen Eddie Lacy, please let the Green Bay Packers know. For now, he's seemed to disappear off the face of the earth. He managed a paltry 10 yards on five carries and lost a fumble before making way for backup James Starks. The poor running game forced the Packers to throw early and often, though of course, getting down by three scores didn't help, either. Aaron Rodgers doesn't get away scot-free, either; on fourth-and-goal with a chance to tie the game, Rodgers didn't throw the ball to a wide open Randall Cobb. Instead, he held onto it for a few more seconds before his desperation heave while being tackled was intercepted. After the game, Rodgers admitted he was scared to throw the ball in that situation. The Packers have looked vulnerable throughout this entire season, but the past two weeks have been especially alarming. Let's see if they can right the ship in time for a big matchup against divisional foe Minnesota in two weeks. The Chargers built up a nine-point lead against the Bears by halftime, but only scored three points the rest of the way. Philip Rivers did his best to keep the team in the game, though a few drops by Danny Woodhead, an unsportsmanlike conduct penalty on Stevie Johnson for spiking the ball after a catch, and lineman D.J. Fluker inexplicably being downfield nullified big gains and a touchdown, respectively. It's hard enough for the Chargers to field a competitive team with all the injuries they have. To toss in stupid penalties on top of that is too much to overcome. Nick Foles threw for 297 yards the first week of the season against the Seahawks. Since then, he hasn't cracked 200 passing yards once. A lot of that is due to the Rams being a run-first team, though Foles is also missing a lot of throws. But Jeff Fisher isn't doing him any favors; the head coach called for a run early on with the Rams trailing 10-6. St. Louis didn't convert, and that extra point may have come in handy in their 21-18 overtime loss to the Vikings. This was the first time the Saints allowed an overtime touchdown since 1979. After going for 108 receiving yards this week, Michael Crabtree has had consecutive games of 100+ receiving yards for the first time in his career. The Cowboys are the only team in the NFL that doesn't have a sack in the fourth quarter. The last five games the Bears have played in have been decided by 12 total points. St. Louis had exactly the same number of passing yards as rushing yards (160). So, so close to a winning record last week. But hey, with the way I'd been going, 2-3 is a minor miracle. Let's keep the momentum going into Week 10. As always, home team is in CAPS. Buffalo certainly looked more impressive in their victory over a Florida team than the Jets did, but I really think the Jags are better than the Dolphins. The Bills are still banged up, and even though this will be billed as a revenge game for Rex Ryan, I like the home team here. When the Rams are favored, they historically don't play as well as when they're an underdog. And Chicago has been in every game in which Jay Cutler has played this year. I don't see that stopping against the inconsistent Rams. The Saints looked dreadful in their overtime loss to the Saints, but prior to that they had been doing alright. Washington has had their ups and downs all season, and while it's hard to peg them any given week, I think New Orleans can win by at least a field goal here. The Ravens shouldn't be favored by nearly a touchdown over anybody, even if they are coming off a bye and a victory in their last two weeks. Jacksonville has looked tough all season, and should be able to keep it close enough. You know, with how close the Cowboys have been in their games since Tony Romo went down, you'd think JUST ONCE they could actually pull out a victory. I believe this is the week. If Matt Cassel can avoid his one or two huge, game-swinging mistakes (that's an extraordinarily large "if"), the running game and defense is strong enough to beat this shaky, young, Tampa Bay team.